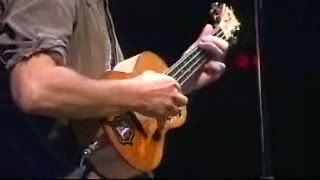 Eddie played riffs from Black Sabbath's "Iron Man" on ukulele before "Soon Forget" and Mike used Led Zeppelin's "Nobody's Fault But Mine" riff to close "Yellow Ledbetter" final solo. This is a professional broadcast video of almost full show (except 2 songs). There is a lag between audio and video which becomes noticable toward the end of the file.